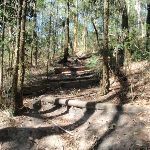 This walk explores the main highlights of Kincumber Mountain Regional Reserve. 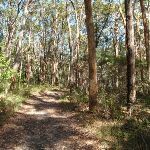 Starting on the Glasson’s trail, the walk explores a variety of forests along the way to Honeman’s Rock and picnic area. 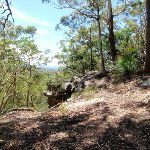 After a rest, you visit a large cave on Kanning Walk and continue to the views at Colin Watters Lookout. You then follow a track down the ridge, passing some interesting rocky outcrops before arriving at the end of Sandringham Close, Terrigal. 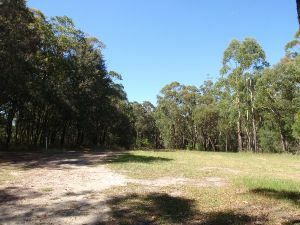 From the car park (about 230m from the end of Kincumber St past the ‘Kincumber Mountain Regional Reserve’ sign), this walk heads to the back of the car park, through the gap in the fence and turns right. The walk follows the track, keeping the water tank up the hill to the right. The walk leads up some timber steps through the rocks and, soon after passing the water tank, the track comes to a ‘T’ intersection with a management trail. Veer left: From the intersection, this walk follows the wide management trail away from the water tank and gently down the hill, keeping the valley to the left. 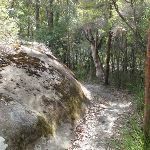 The trail meanders through the bush for about 300m, rounding a wide sweeping right-hand bend – during this bend, the walk comes to a rocky outcrop with a view into the valley (on the left). From here, the walk continues around the bend and up the hill. As the walk enters a more lush section of forest, the trail becomes narrower for a while. The trail then begins to climb again as it widens back out, before coming to a locked gate and road. The walk crosses the road, coming to a small clearing on the other side. Continue straight: From the clearing, this walk heads up the ramp behind the clearing, keeping the road to the left. The track leads up the timber steps, between the timber posts and turns right, heading up more steps. 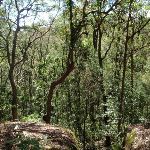 The rocky track flattens out somewhat and heads along the top of the ridge, among the grass trees and angophora forest, where the track then leads down the hill to the road. 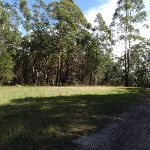 At the road, the walk turns right to follow the road for about 10m, then turns left and follows the track back into the bush (now with the road to the right). 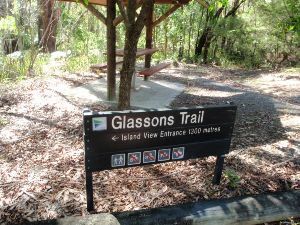 This track gently meanders for almost 100m before coming to the bottom of a car park, a picnic shelter and a ‘Glasson’s Trail – Island View Entrance 1300 metres’ sign pointing back down the track. At the lower end of the overflow car park, near the top of Glasson’s Trail, is a single picnic table and shelter. There are no other facilities here. 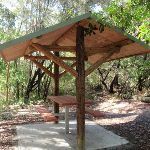 A short distance from the main picnic area, this is an alternative spot for those wanting a picnic table amongst more native trees. Continue straight: From the picnic shelter, this walk heads uphill across the car park to another ‘Glasson’s Trail’ sign, at the base of the stone steps. 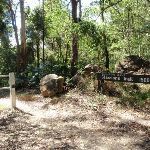 Veer left: From the top of the car park, this walk follows the ‘Glassons Trail – Honemans Rock picnic area’ sign up the stone steps. The track follows the footpath for a short time before coming to a large clearing and another ‘Glassons Trail’ sign pointing back down to the car park. 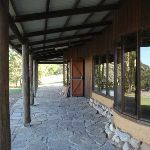 From here, the walk heads across the grassy area, bending to the right around the rock to come to the end of Honeman’s rock (on the left) and a gate (on the right) (just in view of the mud brick building). 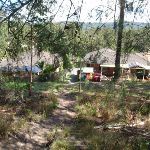 Continue straight: From Honeman’s rock, this walk heads up the hill over the grassy clearing to the front of the mud brick building and the car park on the right. 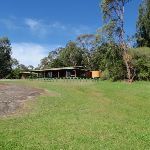 The mud brick building is a landmark in the main picnic area at Kincumber Mountain, and is a popular spot to gather. 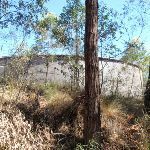 Also known as ‘Kincumber Mountain Information Centre’, ‘The Kiosk’, ‘Kincumber Kiosk’ and ‘Kincumber Mountain Kiosk’, the building was constructed in 1986 with funding from Community Employment Programme. The building is generally locked but can be booked through the local Lions Club for special events. The building has a rain water tank, small kitchen and one main large room. The verandah also provides good shelter. Honeman’s Rock picnic area is a large picnic area at the top end of Island View Drive. 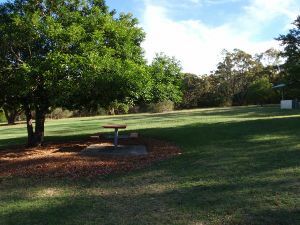 This picnic area has a couple of large grassy areas, composting toilets, free electric BBQs, picnic tables, shelters, garbage bins, drinking water and information signs. 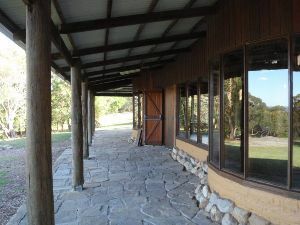 The picnic area is home to a mud brick building (available for hire) and Honeman’s Rock, from which the area derives its name. There is a fair amount of parking available next the picnic area, and some extra spaces a few hundred meters down the road. Honeman’s Rock (aka Honeyman’s Rock) is a large rock outcrop in front of the mud brick building, in the Honeman’s Rock Picnic area. 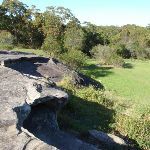 The exposed section of rock is 60m long and about 30m wide, with the western side having a significant unfenced drop. The rock is named after Cecil Lyle Honeman who became a lease holder on the mountain in 1962. The rock has a large depression that once filled with water, and a drain has been dug to keep the pool empty and clear of rubbish. Turn left: From the car park, this walk heads up the road, initially keeping the mud brick building to the left. Soon the road leads to an intersection (next to an information board and fence on the left). Turn right: From the intersection, this walk follows the ‘One Way’ road sign away from the picnic area and along the road. Almost immediately, there is a locked gate and the ‘Kanning Walk’ sign (on the left). 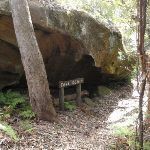 Turn left: From the road, this walk follows the ‘Kanning Walk cave 300 metres’ sign around the locked gate and along the old sandy management trail. After about 120m the walk turns right, following another ‘Kanning Walk’ sign, and passes between two large, exposed tree root systems. Soon after this, the track is concrete for a short distance and passes along the base of a long rock wall. The walk goes down some steel stairs and across a timber bridge, coming to a sandstone overhang cave. 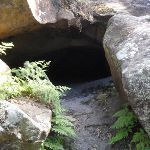 This cave is quite large and has a ‘cave 100m’ sign, pointing further along the track. Follow this sign for about 150m, passing over a steel platform, up a small rise and down some steel stairs. 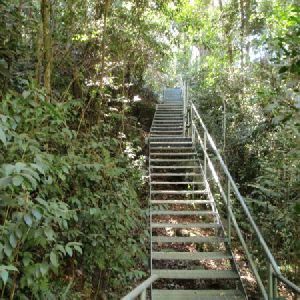 From the base of these stairs, the walk continues for about 25m along the flat track to find the unsignposted entrance to the cave. 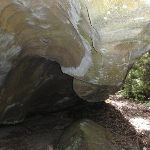 The entrance is between two large boulders on the left. 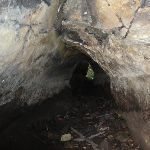 The main cave on Kanning Walk is surprising large for a sandstone environment. 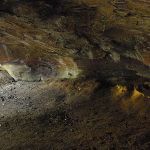 The cave has two main sections. There is a large cabin about 7m wide and 9m deep. A small tunnel extends about 10m further to a small chamber at the back. 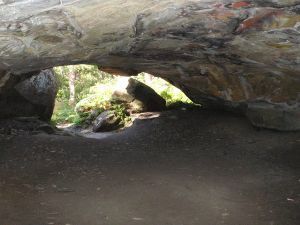 The entrance to the cave is behind two large boulders, providing extra shelter. 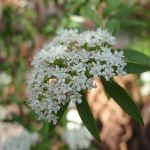 It is believed that A. A. Glasson lived in the cave in the early 1930’s, which was not uncommon during the depression. The cave has proved to be a great place to rest on hot days. Continue straight: From the entrance to the cave, this walk follows the track around the base of the rock wall, keeping the rock to the left. Soon the track passes (and follows) an ‘Alternate Return’ sign then leads up some timber steps. The track soon flattens out and heads through a timber barrier, coming to a ‘T’ intersection with a wide management trail, and a few ‘Kanning Walk’ signs. Turn right: From the intersection, this walk heads north-east, following the ‘Yanina Walk’ sign along the wide trail. 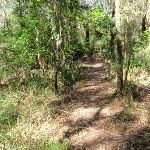 The trail winds through the fern, palm and tall-wooded forest, passing a few small clearings on the side. 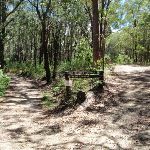 The trail then comes to a clear, signposted ‘Y’ intersection with signs for ‘Colin Watters Lookout’ (leading right) and ‘Nyari Lookout’ (leading left). 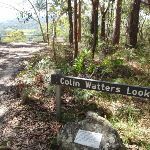 Continue straight: From the intersection, this walk follows the ‘Colin Watters Lookout’ sign gently uphill. 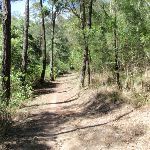 After about 80m, the trail opens up into a large clearing, which the walk continues through (passing a shortcut track on the right). 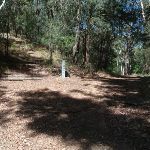 The walk comes to an intersection near the far end of the clearing (just before the picnic table), marked with another ‘Colin Watters Lookout’ sign (on the right). This clearing is found between Nyari and Colin Watters Lookouts. The clearing is next to a large communication repeater tower. There is some natural shade and a solitary picnic table on the northern side. 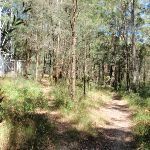 Turn right: From the clearing, this walk follows the ‘Colin Watters Lookout’ sign along the narrower management trail, keeping the tower through the trees on the left. The trail bends left, soon coming to another intersection. Turn right: From the intersection, this walk heads east, directly away from the tower along the management trail, towards the sheltered information board. 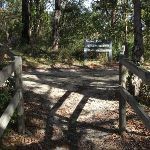 Soon after passing the information sign (and the shortcut track on the right), this walk continues down the trail to the fenced and signposted ‘Colin Watters Lookout’. 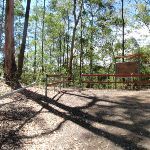 A plaque explains that this lookout was named in 1992 in honour of the Colin D Watters, who was Senior Parks Supervisor with Gosford Council. 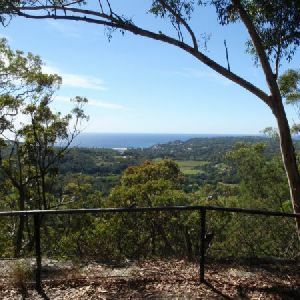 The fenced lookout provides great view south-east, down Picketts Valley to Avoca Lake and Beach. The lookout is also home to an information board, bench seat, picnic table and garbage bin. This lookout offers one of the best views in the park and makes a great spot to stop and rest. Turn left: From the lookout, this walk follows the narrower track, initially keeping the view and fence on the right. The track soon bends left and passes and informal track (on the right), coming to a clear intersection with a wider trail near the large tower. Turn right: From the intersection, this walk heads north-east away from the tower (keeping it behind and to the left), moving towards the rocky outcrop. The track passes the rocks and continues along the flat section to a larger rocky outcrop. 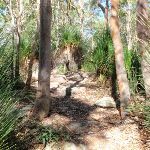 Here, the walk keeps the rocks to the left, following the track between the gums and grass trees, with filtered views to the right. Keeping near the top of the ridge, the track continues down past the rock to a small clearing and intersection with a management trail. 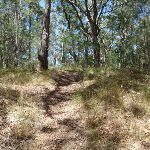 Veer right: From the intersection, this walk follows the narrow track downhill along the top of the ridge, initially keeping the management trail down to the left. After about 120m, this walk takes the right-hand fork at a ‘Y’ intersection and, another 150m later, turns right again in front of the large, dead tree. The track leads down a few steps and across a flat saddle for a short time. The track then turns left and heads down a long series of timber steps, coming to a wide management trail at a five-way intersection. 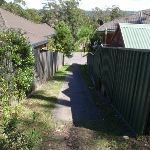 Turn left: From the intersection, this walk follows the narrower track downhill between the timber barriers, towards the houses. The track leads down a series of timber steps and then down a concrete path (and steps) between two houses, coming to the end of Sandringham Cl. 2.7km of this walk has gentle hills with occasional steps and another 860m is very steep. Whilst another 780m has short steep hills and the remaining 140m is flat with no steps. 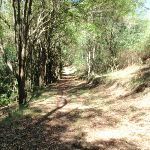 2.6km of this walk follows a clear and well formed track or trail and another 1.6km follows a formed track, with some branches and other obstacles. The remaining (270m) follows a smooth and hardened path. 3.4km of this walk is clearly signposted and another 940m has directional signs at most intersection. The remaining (170m) has minimal directional signs. 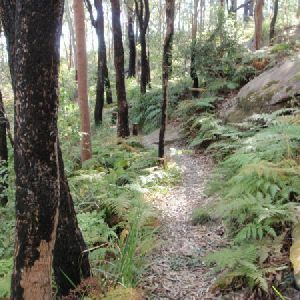 3.4km of this walk requires no previous bushwalking experience and another 940m requires some bushwalking experience. 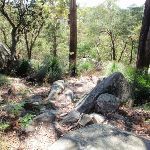 The remaining (170m) requires a leader a with moderate level of bushwalking experience. This whole walk, 4.5km is not usually affected by severe weather events (that would unexpectedly impact safety and navigation). This whole walk, 4.5km is close to useful facilities (such as fenced cliffs and seats). 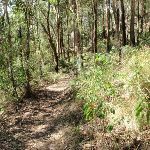 A list of walks that share part of the track with the Kincumber to Terrigal (via Glasson’s Trl) walk. 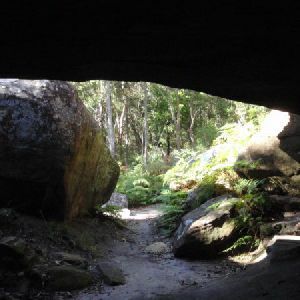 This short walk follows a clear track to a large sandstone cave on the Kanning Walk. 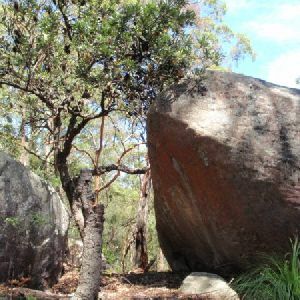 From the Honeman’s Picnic Area, follow Kanning Walk through the bush and along the side of a long rock wall. There are several caves along the way, the main one being quiet large and tucked behind some large boulders. The cave provides a cool spot on hot days. 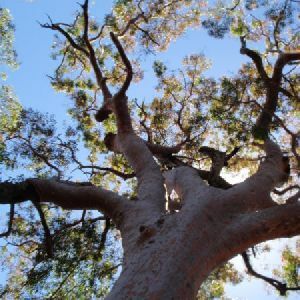 After admiring the cave, walk back the same way, passing some large angophora trees. 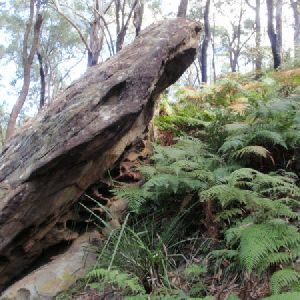 The Ridge Trail loop is a short walk starting from Honeman’s Picnic Area and follows the signposted Ridge Trail until finding Split Rock management trail. Here, you turn sharply right to head back to the picnic area along this wider trail. There are limited views along this walk, but it still makes for a nice stroll through the bush. 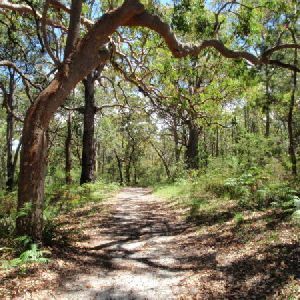 This lovely walk is a great way to explore the bushland at the top of Kincumber Mountain. From near the main picnic area, you follow a clear track before walking along the base of a long rock wall. 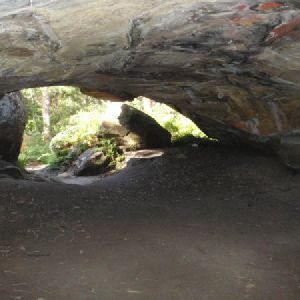 There are a few sandstone caves, the main one mentioned in the notes is quite large, and a nice cool spot on a hot day. 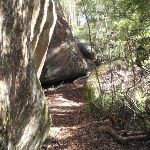 This walk then heads past the cave to loop back to the start via the Yanina Walk management trail. 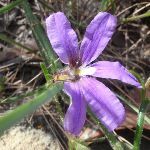 There are good wildflower displays in spring and summer. 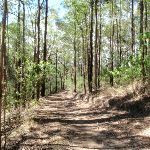 Glasson’s Trail starts near the main entrance to Kincumber Mountain Reserve and follows a series of management trails and tracks up to the main picnic area. 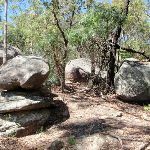 The walk offers a great way to explore the diverse vegetation and visiting some interesting rock formations. The walk is signposted and crosses the road a few times before coming across a single picnic table near the end of the walk. The walk finishes at the more popular picnic area at Honeman’s Rock. 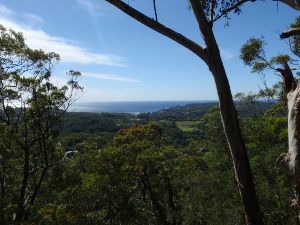 This walk starts from Terrigal suburbia and leads up through the dry bush to the wonderful views at Colin Watters Lookout. On the way, you pass some large boulders scattered with red gums and grass trees. 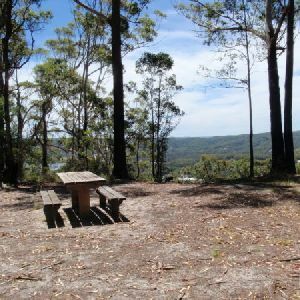 At the top, you will be greeted with good views over Avoca, and a picnic table encouraging you to soak up the view. 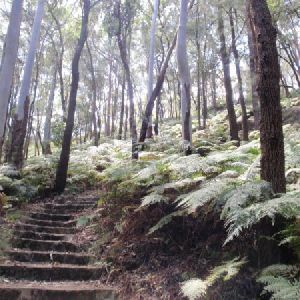 Starting from Sandringham Close, this walk follows the Sandringham Track up the hill to the views from Colin Watters Lookout. After enjoying the views, you walk past the tower to the other side of the hill to the much less spectacular Nyari Lookout. From here, you follow a wide management trail down the hill, back to the start of the walk. An enjoyable circuit walk for those who do not mind hills, worthwhile for the views from Colin Watters Lookout. 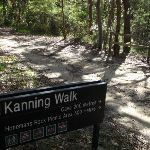 Yanina Walk is a gentle walk, exploring one of the ridges at the top of Kincumber Mountain. 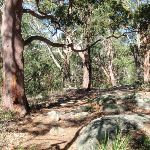 The walk follows a wide management trail from the main Honemans Picnic area, leading to the good views of Colin Watters Lookout. The notes describe a side trip to Nyari Lookout, but the views are very limited. 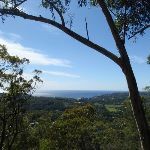 The view from Colin Watters Lookout is arguably the best in the park, extending down Picketts Valley to Avoca Lake and Beach. There is a picnic table at the lookout, encouraging a snack before returning to the start. 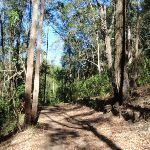 A list of walks that start near the Kincumber to Terrigal (via Glasson’s Trl) walk. 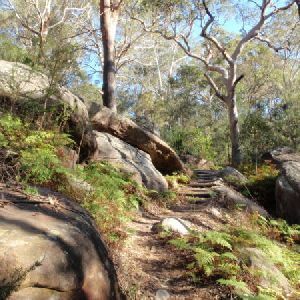 Sid Pulsford Walk explores the ridge top of Kincumber Mountain, from Honeman’s Rock to Green Point. The walk mostly follows wide management trails. Halfway along the walk, you will find the By-Pass lookout and rest area, providing good views and a great place to rest. 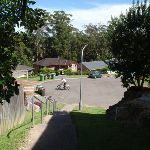 The walk leads past the water reservoir above Green Point, then down the driveway to the end of Beatties Rd. 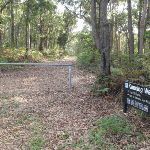 This short and fairly flat walk starts from the popular Honeman’s picnic area and follows the Sid Pulsford Walking Track, then another trail to Warriwarri Lookout. The lookout is overgrown and provides no real view. A short distance beyond the signposted lookout is a rocky outcrop that provides some filtered views of the district. A nice walk through the dry ridge top forest, just don’t expect grand views. 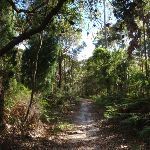 Starting on Bembooka Rd in Erina, this walk heads up the narrow Warri Warri track to Honeman’s picnic area. 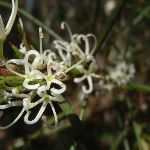 You will visit the overgrown Warriwarri Lookout about halfway along this walk, but do not expect grand views! 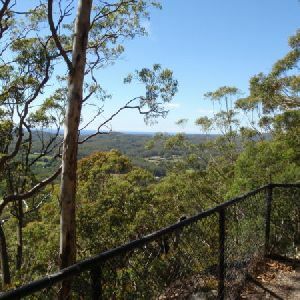 From the lookout, the walk follows wider trails along the much flatter ridge top to the popular Honeman’s Lookout. 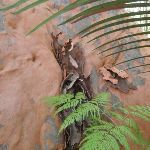 A great walk through some beautiful pockets of rainforest in the Rumbalara Reserve. Parts of the track are quite steep, although the well-formed track with plenty of steps makes the walking easier. 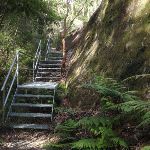 As well as the beautiful rainforest scenery, this walk includes some glimpses into an old quarry at Cappers Gully and an optional side trip to one of the Rumbalara bronze sculptures. Plenty of variety and a beautiful walk. 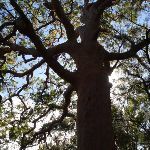 An extended version of the Rumbalara Reserve Rainforest Walk. 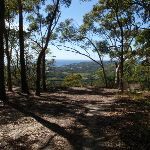 After walking through some beautiful pockets of rainforest, this walk continues to the upper section of the reserve, enjoying some great views across Gosford and the surrounding areas. The sheer variety in the vegetation from the start of this walk to the end makes it even more interesting. Parts of the track are quite steep, although the well-formed track with plenty of steps makes the walking easier. This walk also takes you past three of the four Rumbalara bronze sculptures. Plenty of variety and a beautiful walk. Note that the entrance gate on Dolly Ave, for the upper section of Rumbalara, is locked at 8pm each evening. A surprisingly nice fire trail walk. A lot of the forest scenery along this walk is really beautiful. Much of it is very moist forest, filled with ferns. 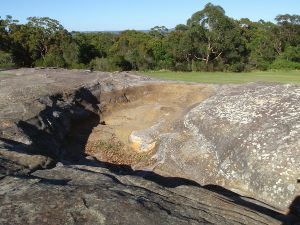 You also get a glimpse of an old quarry at Cappers Gully, adding a little historic interest to the walk. 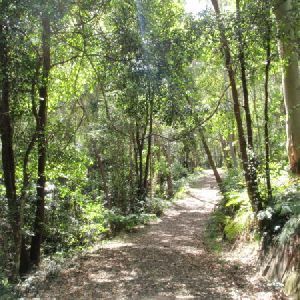 A very nice loop walk in the lower part of the Rumbalara Reserve, Gosford. 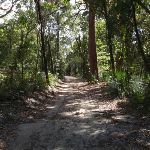 The walk includes a section of road but spends most time in very nice forest scenery, including pockets of the beautiful rainforest in the reserve. 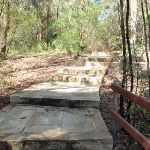 This walk has substantially fewer steps than some of the other walks in the reserve and is a great way to see some of the beautiful scenery in Rumbalara. 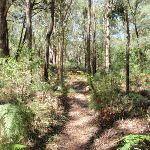 A great walk with some spectacular views and nice forest scenery in the Rumbalara Reserve, near Gosford. 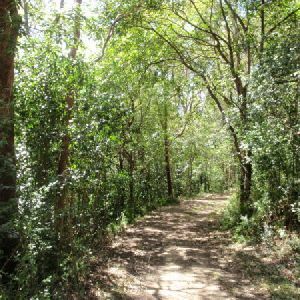 The tracks are well formed and signposted, and there are plenty of facilities in the reserve, including free electric BBQs. 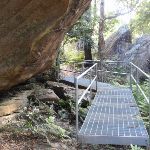 This walk is very accessible from Gosford and a great way to enjoy some of the wonderful scenery and views of the area. Note that the entrance gate on Dolly Ave, for the upper section of Rumbalara, is locked at 8pm each evening. 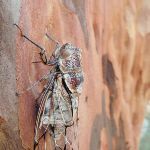 A great circuit walk, covering two of the popular walking tracks and some of the great sights in the upper section of the Rumbalara Reserve. 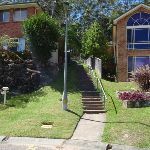 You will enjoy some really nice forest walking and fantastic views across various parts of Gosford and the surrounding areas. Note that the entrance gate on Dolly Ave, for the upper section of Rumbalara, is locked at 8pm each evening. 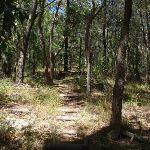 A great circuit walk, covering most of the walking tracks and sights in the upper section of the Rumbalara Reserve. 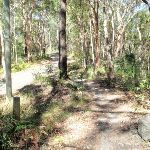 There is some really nice forest walking and plenty of spots along the way offer fantastic views across various parts of Gosford and the surrounding areas. Note that the entrance gate on Dolly Ave, for the upper section of Rumbalara, is locked at 8pm each evening. 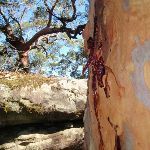 At the time of writing, some or all of the southern leg of the Red Gum Track was closed. The walk described here returns along the road instead. Despite these changes, this is still a worthwhile walk with some nice scenery along the way. 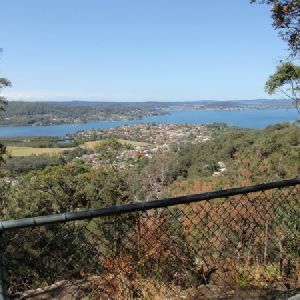 Wannagan Lookout has some great views over North Gosford and surrounds. Note that the entrance gate on Dolly Ave, for the upper section of Rumbalara, is locked at 8pm each evening. 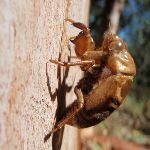 An excellent walk, crossing the Rumbalara Reserve and covering plenty of the scenic highlights of the reserve. 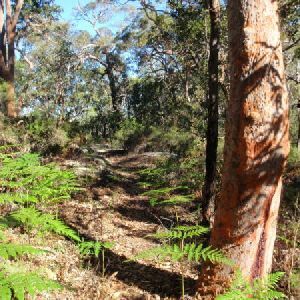 This walk goes through beautiful pockets of rainforest as well as the drier ridgetop forest, showcasing the great variety of scenery in Rumbalara. 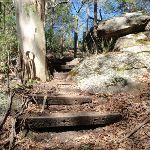 There is some steep walking along the way, though the well-formed tracks and steps along much of the walk makes the going easier. The descent to Tottenham Pl is on a less well-defined track. 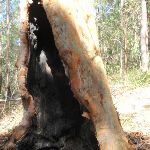 http://new.wildwalks.com/wildwalks_custom/includes/walk_fire_danger.php?walkid=nsw-kincumbamrr-kttgtacwl Each park may have its own fire ban, this rating is only valid for today and is based on information from the RFS Please check the RFS Website for more information.